When they named Universal’s Islands of Adventure, they weren’t kidding! This park is full of fun and great attractions! 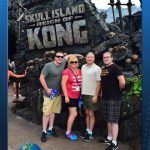 Our Orlando vacation was spent in both Universal Orlando’s parks, Universal Studios and Islands of Adventure, but Islands of Adventure was our favorite! When you enter the park, you walk through a bustling market place. There are several shops offering souvenirs, coffee and baked goods. If you’re anything like my family, you just ignore these stores and head straight to the rides! If you make a quick left, you will see the enormous Incredible Hulk Coaster. 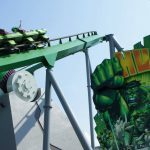 The Incredible Hulk Coaster at Islands of Adventure’s Marvel Super Hero Island. You can almost feel the power as you transform from the mild mannered scientist, David Banner. The Hulk launches you up to 67 miles per hour while you twist and turn through a zero gravity roll. This one is not for the faint at heart! 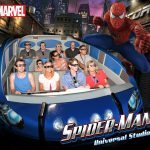 If you survive the Hulk, keep the Super Hero vibe going with the 3-D adventures with Spider Man. Throw on the special glasses and hang on! You can help the webbed one fight the Green Goblin while traveling through the buildings and streets. I am prone to motion sickness and this one didn’t bother me. The graphics and motions are timed perfectly! When walking the streets of Marvel Super Hero Island, keep an eye out for the X-Men riding on their quads. 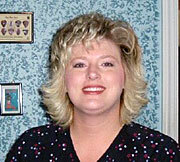 They offer several meet and greets throughout the day. As you meander, the next stop will be Toon Lagoon. This is the place to be on a hot day! Dudley Do Right’s Rip Tide Falls will be sure to cool you off! Jurassic Park has a ton of great offerings as the largest island, at 21 acres! Don’t miss the Jurassic River Adventure. 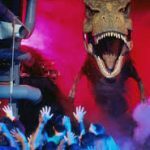 The tour will show you some amazingly realistic dinosaurs! But beware! Your boat may be bumped off course and you might end up in the Raptor area! But, not to worry. This is nothing compared to the T-Rex that tries to eat you at the end! The Jurassic Discovery Center allows you to see the huge fossils, check your DNA to see what kind of dinosaur you would be or watch a baby dino pop out of his egg. 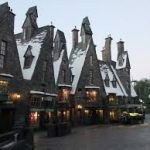 Next is the most popular area in the park, The Wizarding World of Harry Potter, Hogsmeade. I will tell you that it is incredible and crowded! If you haven’t bought a wand yet, stop by Olivander’s and pick your perfect tool. I was dumbfounded by the number of wands available! There are several places to cast spells. Just look for the markings in the pavement. The most coveted attraction is Harry Potter and the Forbidden Journey. You enter through the towering castle gates and make your way down the familiar passageways and corridors of Hogwarts. 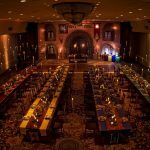 You’ll visit Dumbledore’s office, the Defense Against the Dark Arts classroom, the Gryffindor common room, the Room of Requirement and more. You will soar above the castle while you join Harry on an adventure. This attraction uses state of the art technology but, I will warn you, I did get sick. The seats move in all directions, including tilting back. I think that’s what got me. I closed my eyes but with the rough motion, it didn’t help. While you are in the Harry Potter area, try a Butterbeer. It is surprisingly, very good! You can pick over ice, hot or smoothy style. 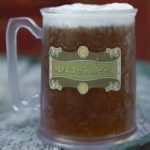 If you like butterscotch, you will love a Butterbeer with it’s frothy top! This is when you need a park to park pass. 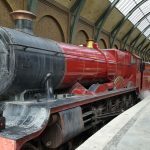 It is the only way that you can take a ride on the Hogwart’s Express. If you don’t have the correct pass, you can upgrade at the train station. This line can be very long. It’s better to purchase the park to park, with your package, in order to avoid this line. Speaking of lines, the two Harry Potter areas do not allow the front of line passes. You can use them everywhere else. Unfortunately, this is where they need it the most! We stopped by Three Broomsticks for lunch. I had fish and chips and it was very tasty. My kids tried the Turkey Leg and they liked it, too. Our favorite attraction, hands down, was Reign of Kong! The powerful roar and chest pounding of Kong is so lifelike! The ride is full of excitement and non stop adventure! DON’T MISS THIS ONE! Seuss Landing is a great spot for little ones. My kids are adults so we skipped over this area. We did spend a lot of time here on our previous trip, when they were younger. 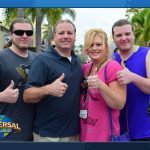 Universal Parks has so much to offer! Check for my next blog about City Walk and some of the great dining options. I will also add some tips that I’ve discovered while on my visit. If you need any help planning your Universal adventure, contact one of the helpful Travel Pixies at Our Laughing Place Travel.